DESCRIPTION Party hats made from newspapers. DETAILS I envisioned a memorial day parade with us all wearing patriotic paper hats. 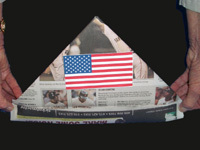 After making the hats as directed, print the two flags and glue one on each side of the hat. They represent today's flag and the flag that existed when memorial day (then known as decoration day) was first celebrated in 1862 to honor those who died in the civil war. If you are using a standard newspaper, your hat will comfortably fit a child, but will be a bit skimpy on an adult. For a bigger head, use an advertiser newspaper which is usually a little taller. The possibilities for decoration are endless - paper flowers, butterflies, stars, lady bugs etc.